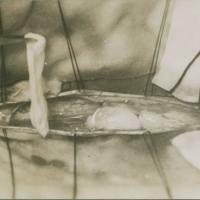 Between 1920 and 1970 the medicine and surgery departments of the University of Cape Town evidently saw many patients with hydatid disease, often referred from surrounding farming areas and even from the Eastern Cape province. 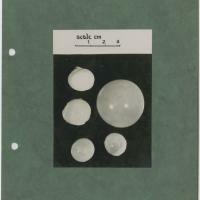 This is reflected in around 80 surviving museum specimens and the clinical photographs archived here. But it was a Groote Schuur radiologist, Dr Walter James Latham (O.B.E), who put together the most comprehensive local review of the disease. 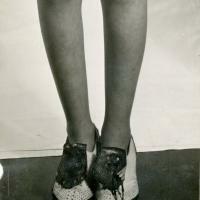 This photographic archive documents hydatid disease in livers, lungs, kidneys, spleens, muscles, bones, brains and more. 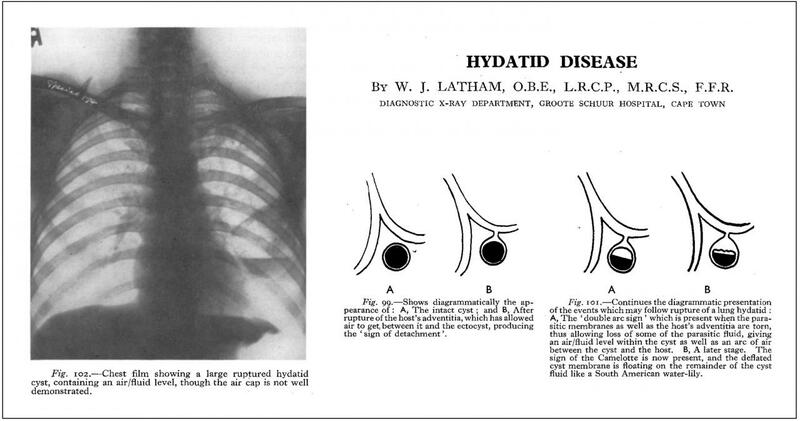 Dr Latham used these patients’ photographs and X-rays to illustrate his paper “Hydatid disease” (Latham, 1953). Dr Latham went on to be admitted to Royal College of Radiologists on the strength of his dissertation on hydatid disease. Five opaque cysts, with guide rule, ranging in size from 1.5 to 3cm in diameter, evidently removed from the thigh. As of 2012, there were 162 published reports of hydatid disease in South Africa (Wahlers et al, 2012). This is an indication that it has been a common disease in this country in recent history. 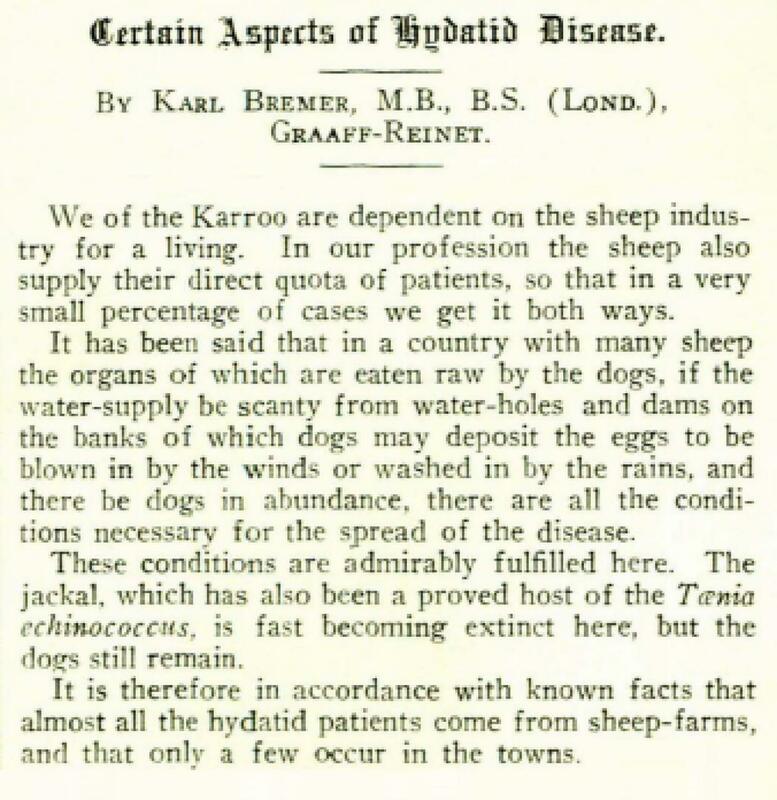 The earliest paper could be one by a Dr K Bremer working in the Karoo districts of Cradock and Graaff-Reinet, who reported 8 cases in the South African Medical Journal of May 1921 (Bremer, 1921). Over the following decades there were reports of hydatid disease in numerous individual patients, affecting almost every organ. These reports continue today (Andronikou et al, 2002; Ndondo et al, 2003). Surprisingly, there has never been an epidemiological survey to put a figure on how common human infection actually is in South Africa, even though there have been veterinary surveys in wild and domestic animals. During one such survey in domestic dogs around Pretoria back in 1934, Dr Reinhold Ortlepp distinguished South African veterinary parasitologist, identified a couple of new species of echinococcus (Ortlepp, 1934). Today his work is recognized in the species name E. ortleppi. The WHO considers cystic echinococcosis (hydatid disease) to be endemic in contemporary South Africa (Eckert et al, 2002). The adult worm resides in the gut of canids (wild and domestic dogs, jackals, foxes) while the larvae develop in the tissues of ungulates (hoofed animals). 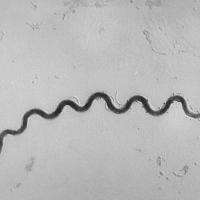 In Southern Africa the parasite tends to cycle between domestic dogs and sheep, and so is mainly encountered in sheep-farming areas of the country. "In childhood the fingers travel readily and often to the mouth, without the intermediate blessing of soap and water"
Eggs gain access to human digestive tract, where they hatch, and the embryo then burrows through the gut into a vein, and so gets access to any part of the body via the circulation. 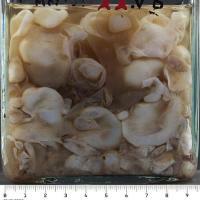 Most (80%) come to rest in the liver, about 10% in the lung, and the remainder in just about any other site. There a cyst is formed and slowly grows, with proto-tapeworms developing within it. The cyst is generally only detected when it becomes large enough to cause symptoms, and then is best carefully removed through surgery. Complications can be fatal. 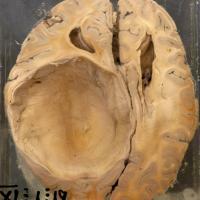 Hydatid cyst of the brain, 1929. 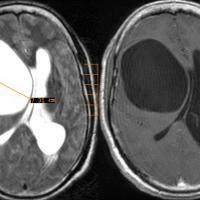 Contemporary MRI of viable hydatid cyst of the brain. 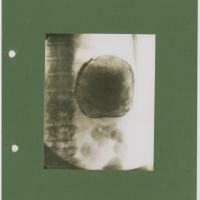 Contemporary intra-operative photograph of a pelvic hydatid cyst. 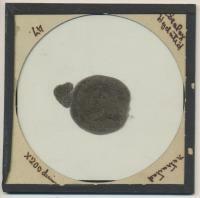 Hydatid cysts removed from peritoneal cavity, 1946. "A disquieting feature of this farmdog-man relationship is the indifference and total disregard for the preventive aspect of hydatid disease on the part of the laity and medical people alike. For instance a physician I know, who lives in the Karoo just inland from a small seaside resort, comes on weekends down to the sea with his wife and small children and often squeezes the huge family dog into the already overcrowded car" (De Villiers, 1957). 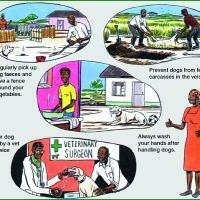 Today, improved sanitation, meat inspection and regular deworming of domestic dogs are the mainstays of disease control. 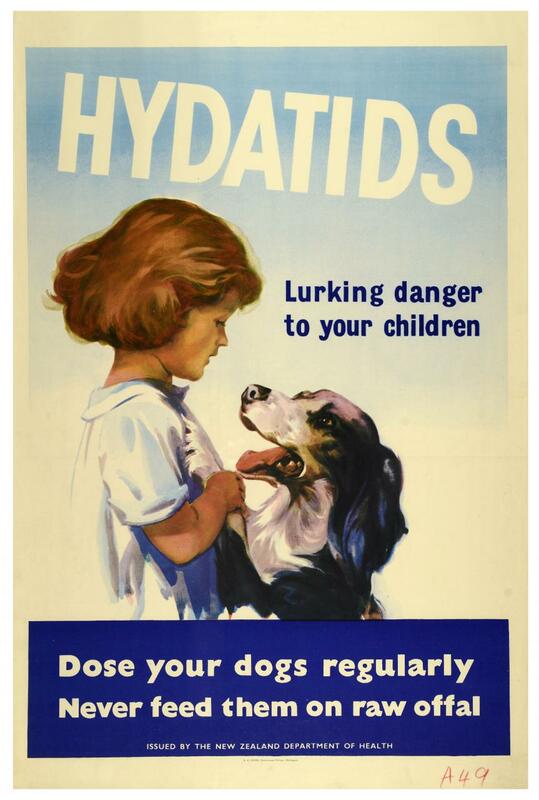 New Zealand, like other sheep-farming settler nations including South Africa and Australia, published public health posters warning about the risk of hydatid disease. 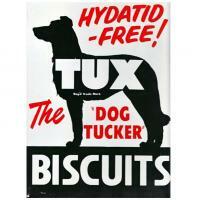 A New Zealand advertisement for dog biscuits referencing the connection between dogs and hydatid disease. 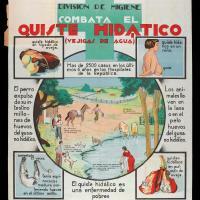 A Spanish public health poster about hydatid disease. A Czech poster board used for educational purposes at Charles University in Prague. Andronikou S, Welman CJ, Kader E. Classic and unusual appearances of hydatid disease in children. Pediatric Radiology. 2002; 32(11): 817-28. Bremer K. Hydatid disease. South African Medical Journal. 1921; 19(9): 165-7. Bremer K. Certain aspects of hydatid disease. South African Medical Journal. 1927; 1(12): 301-4. 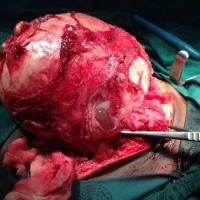 De Villiers H. The threat of hydatid disease to the South African citizen. South African Medical Journal. 1957; 31(28): 700-2. Eckert J, Gemmell MA, Meslin FX, Pawlowski ZS, editors. 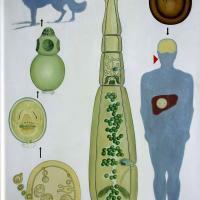 WHO/OIE manual on echinococcosis in humans and animals: a public health problem of global concern. 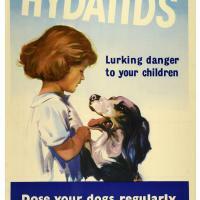 Paris: World Organisation for Animal Health; 2002. Latham WJ. Hydatid disease: Part 1. 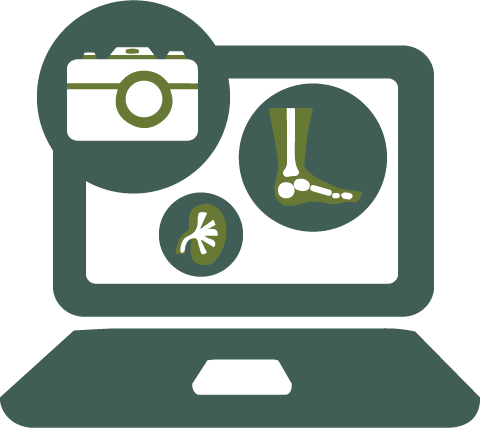 The Journal of the Faculty of Radiologists. 1953; 5(1): 65-81. Latham WJ. Hydatid disease: Part 2. The Journal of the Faculty of Radiologists. 1953; 5(2): 83-95. Ndondo AP, Fieggen G, Wilmshurst JM. 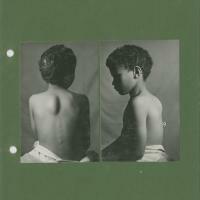 Hydatid disease of the spine in South African children. Journal of Child Neurology. 2003; 18: 343-46. Ortlepp RJ. Echinococcus in dogs from Pretoria and vicinity. Onderstepoort Journal of Veterinary Science and Animal Industry. 1934; 3(1): 97-108. Wahlers K, et al. Cystic echinococcosis in sub-Saharan Africa. The Lancet Infectious Diseases. 2012; 12(11): 871-80.